In February 2017, Intact Media Group’s TV division showed audience evolution on the most important and disputed time interval, Prime Time, on all targets (commercial, urban and national) compared to the same period of last year. The entire Group, as well as each of the five TV stations scored market share appreciation. Moreover, Intact is the only media group with three channels ( Antena 1, Antena 3 and Antena Stars) in top 10 TV stations on a national level, while having four TV stations in top 15 ( the aforementioned and Happy Channel). As such, Intact Media Group’s TV stations led key time slots, both on the Urban and National targets. Commercial target: Intact’s channels have market share appreciations during Prime Time (+11%). Urban All: the TV division leads most time slots, amongst which Whole Day and Prime Time. Market share numbers increased during Prime Time (+6%), compared to February 2016. 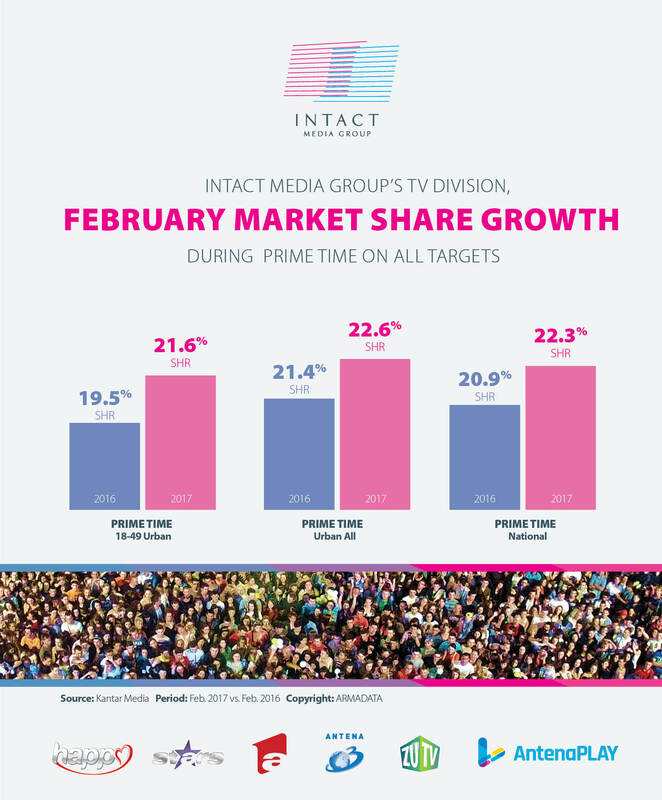 Național: Intact Media Group’s TV stations hold the first position during Whole Day, Day Time and Access, with market share appreciation during Prime Time (+7%) and Day Time (+2%), compared to February 2016. 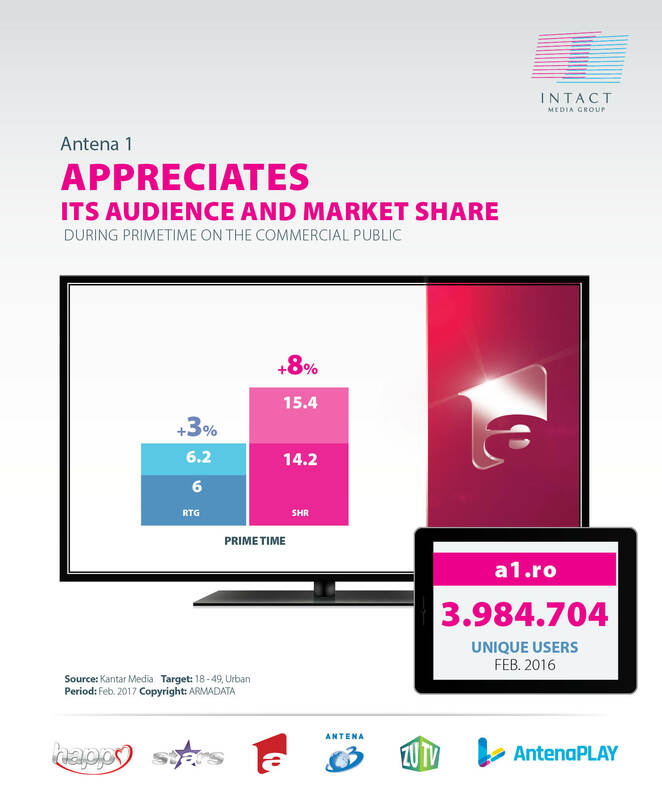 Antena 1, the flagship entertainment channel, home to the largest star system in Romania, has market share and audience evolution during Prime Time on the commercial target. In this respect, primetime numbers boost by 8% market share and 3% audience appreciation on the commercial target. Late Fringe appreciates by 4%, due to the newly launched late night show XNS . “Chefi la cuțite”( Game of Chefs) ( 100% leadership during its broadcasting slot) “Te cunosc de undeva” ( Your face sounds familiar), followed by “Next Star” “Te pui cu blondele?”( Beat the blondes) were amongst February’s most watched productions. 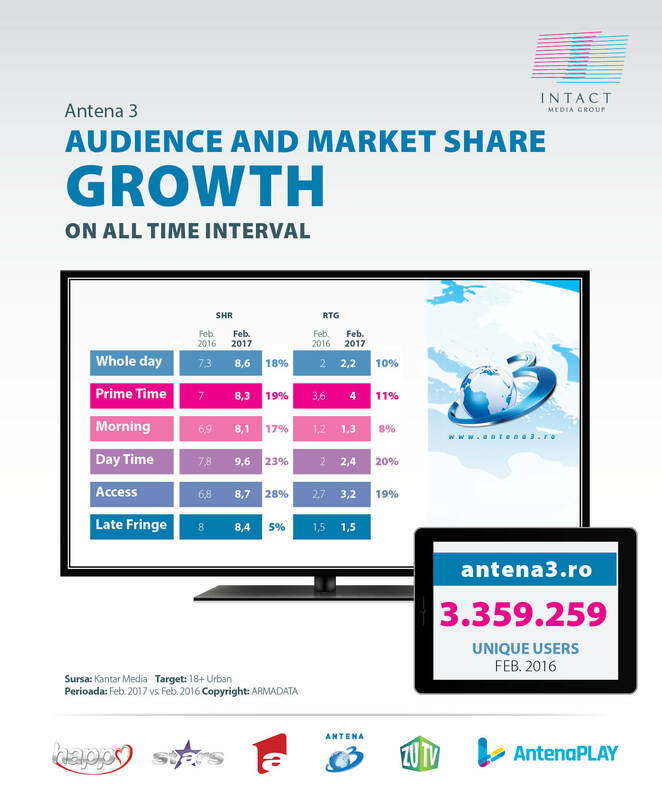 Antena 1 was watched in February, during Whole Day, for at least one minute, by 8.2 million Romanians, whilst www.A1.ro had almost 4 million unique users. Antena 3 is leader of the news niche in Romania during February on key time slots, amongst which Prime Time. At the same time, it scores audience and market share appreciation on all time intervals, compared to February 2016. As such, audience appreciates by 10% during Whole Day and by 11% during Prime Time, while the market share rises by 19% during Prime Time and 18% during Whole Day. Antena 3 was watched by more than 4.7 Romanians every day, on the National level.”Punctul de intalnire”, “Adevaruri ascunse”, “Q&A”, Sinteza Zilei”, “Subiectiv” were the most watched productions in February. On the digital front, Antena3.ro had more than 3.3 million unique users in February. Antena Stars, the only TV channel dedicated to celebrity buzz, was watched during February by more than 3.2 million Romanians, on the national target, during Whole Day, for at least one minute. Antena Stars’ most popular productions last month were “Răi da’ buni”, “Dincolo de aparențe”, “Agenția VIP” ,“Alege Dragostea”, “Star Chef”. For Valentine’s Day, Antena Stars launched the campaign “When << I love you>> is not enough” inviting its viewers to surprise the most endeared woman in their lives in an original way. 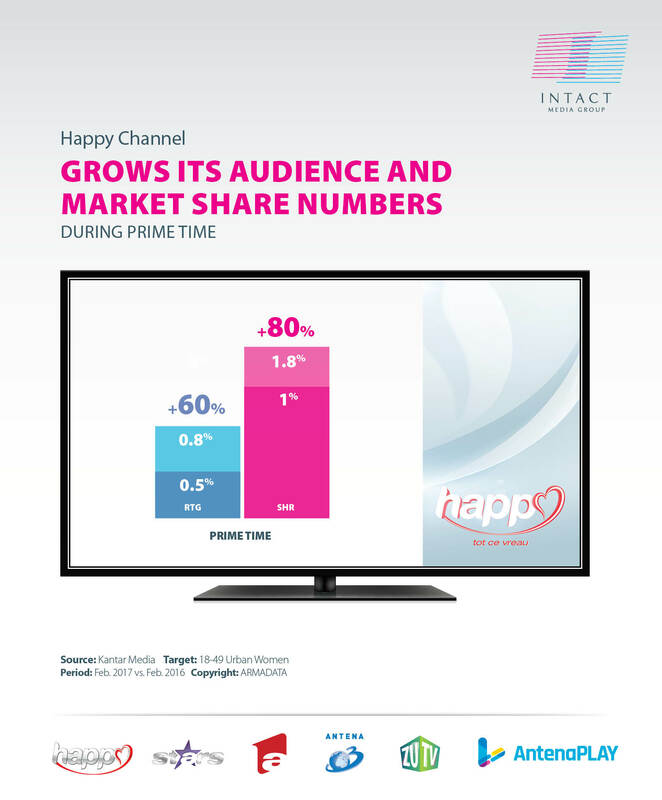 Happy Channel, the Group’s TV station addressed to daring women, had market share (+80%) and audience (+60%) appreciation during Prime Time compared to February 2016. More than that, there is market share appreciation during Whole Day (+9%) and Access (+10%). “O poveste de iubire” (Love Story),” Elif”, “Sezonul cireselor” (Cherry season), “Gossip Girl”, “Downton Abbey” were the most watched productions in February. ZU TV, the channel that addresses the young generation (15 – 34 years old, urban population) captivated its public with productions such as “ZU Party Romanian Tour”, “Miezu”, “Most wanted”, “ZU Music Mix”. In February 2017, a month of high social turmoil, www.a1.ro remained Digital Antena Group’s no.1 site in terms of unique users, with almost 4 million, occupying 10th place in the overall website top in Romania. Observator.tv continues its expansion, having its best month since its relaunch in December. Spynews.ro and Antena3.ro reached more than 3 million unique users. In February 2017, more than 10 million Romanians watched Intact’s productions during Whole Day, for at least one minute, on national level and 7.6 million during Prime Time.